IoTPAC - Controller + SCADA + more! Each SoftPLC PAC (Programmable Automation Controller) runs on GatecraftTM Linux, which is an embedded Linux operating system distribution developed by SoftPLC Corporation. Using Linux as a platform provides benefits such as multi-tasking, background logging of critical operations, support for open communication standards like SSH, FTP, PPP, SNMP, and more. Optionally, a Web Studio Linux runtime, called "IoTView" can be installed into any SoftPLC CPU and runs as a separate task. The SoftPLC task is assigned by default a higher priority, ensuring that any I/O devices are scanned quickly and deterministically. Web Studio communicates to SoftPLC's data table through a driver that sends/receives values through the CPU's RAM memory, providing fast data updates with no need for cables. 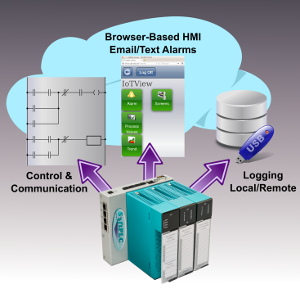 IoTView provides a user interface via HTML5 web pages, which can be viewed in any modern web browser over any Ethernet or Internet connection to the IoTPAC. Most users require no knowledge of Linux to use SoftPLC or IoTView - the operating system is transparent and users interact with SoftPLC through TOPDOC NexGen software and the Web Studio runtime application via a web browser. SoftPLC, with or without the Web Studio runtime, is an embedded "headless" system, designed to run in hardware with no fragile components such as a hard drive, monitor or user input device (keyboard, mouse, touchscreen). Also, unlike many "PC-based" control software products, SoftPLC doesn't put your system at risk by running on an office platform like Windows or Windows “band-aids” - there is no need to be concerned about “the blue screen of death”, or other applications running in the computer causing the controller to become non-deterministic or to fail. SoftPLC Controllers are designed to run 365 days a year, 24 hours per day – and do! 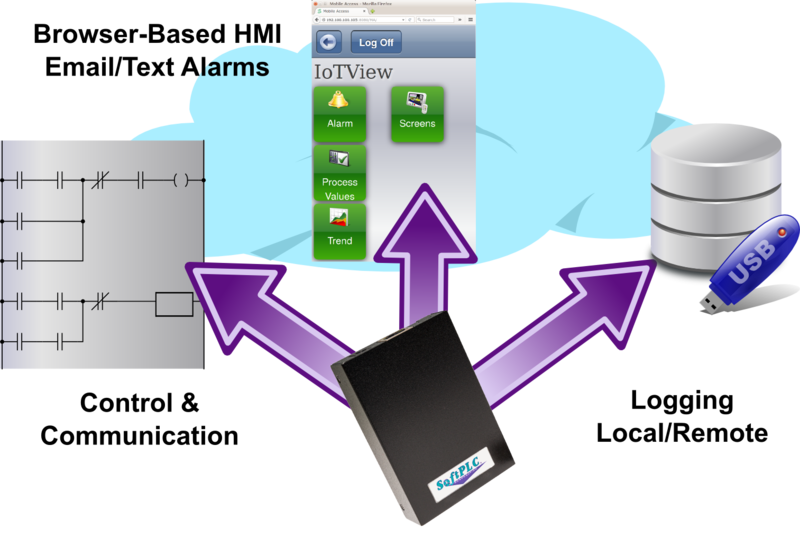 Any Smart SoftPLC plus the Web Studio embedded Linux runtime creates an IoTPAC. The Backplane3 version is shown in the figure, but other Smart configurations are all applicable as well. Examples include LocalPorts and standard versions that utilize 3rd party I/O connected via Ethernet, serial or other industrial communication networks. 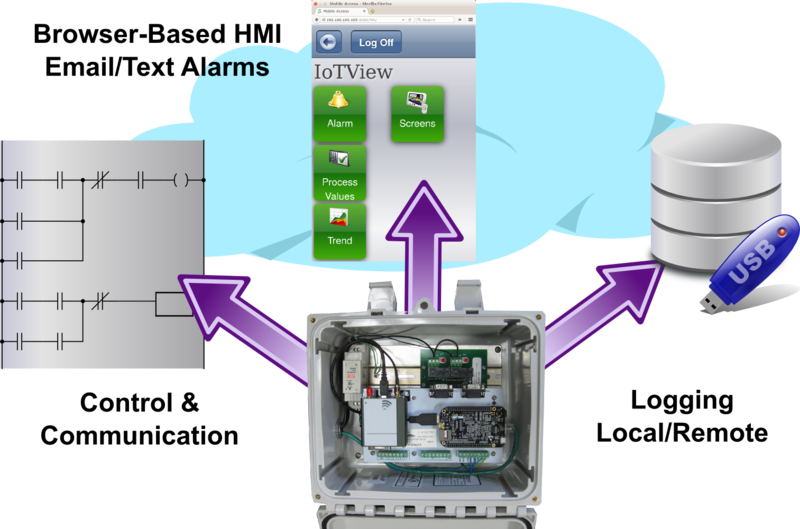 Any Micro SoftPLC plus the Web Studio embedded Linux runtime creates an IoTPAC. The Micro Assembly with enclosure is shown in the figure, and would support Ethernet, serial or USB I/O connections. Other configurations are possible. For example, the left figure shows a low cost comprehensive RTU solution utilizing the Micro SoftPLC plus our I/O board (Cat No SPBB-6DI2SP1AI), a relay output board and a cellular modem.